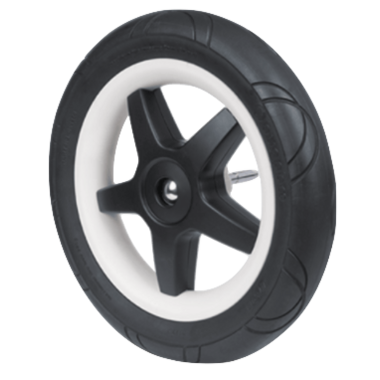 The Bugaboo Donkey2 foam wheels have been designed to simulate an air pressure of 1.5 bar, the prefect hardness for all use. This hardness is in line with what we used to specify for the air tires up to the maximum load cases. The outer tire assurances the proper wear-and-tear and grip on any surface, while the foam core assures the right hardness.